Figure 1. A debit card counts as money, but a credit card does not. Money is not a specific item, but rather anything that has the functions of money, including its general acceptability as a means of payment, and its service as a store of value. Money is an asset, in contrast to credit, which while it serves as a means of payment is actually a liability. In other words, credit is a loan that must be repaid, usually with interest. 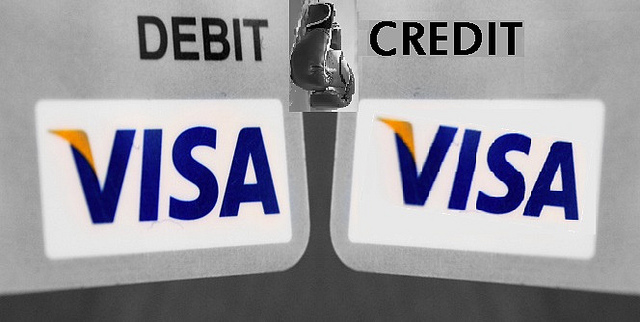 Thus, a credit card is not money, but a debit card is. The latest creation and perhaps one of the purest forms of fiat money is the Bitcoin. Bitcoins are a digital currency that allows users to buy goods and services online. Customers can purchase products and services such as videos and books using Bitcoins. This currency is not backed by any commodity nor has any government decreed as legal tender, yet customers use it as a medium of exchange and can store its value (online at least). It is also unregulated by any central bank, but is created online through people solving very complicated mathematics problems and receiving payment afterward. Bitcoin.org is an information source if you are curious. Bitcoins are a relatively new type of money. At present, because it is not sanctioned as a legal currency by any country nor regulated by any central bank, it lends itself for use in illegal as well as legal trading activities. As technology increases and the need to reduce transactions costs associated with using traditional forms of money increases, Bitcoins or some sort of digital currency may replace our dollar bill, just as man replaced the cowrie shell. You can learn more about Bitcoin in the following video. In this module, we learned how the supply of money in the economy is largely determined by the amount of loans made in the banking system. In the next module, we will learn how the Federal Reserve, the central bank in the U.S., takes advantage of the loan-making process to control the money supply and credit conditions.